Will You Still Love Me Temari? 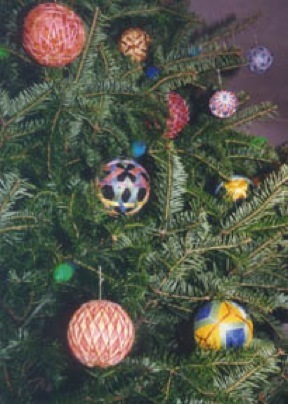 As we come to a new year, I find myself thinking of temari balls. Why temari? Well, because they are a traditional New Year’s gift from mother to daughter in Japan. And because I can’t help thinking that a couple would look really nice on my Christmas tree. I’m all about the re-imagining. When they started out, temari balls were more or less Asian proto-hacky-sacks based on wads of worn out kimono and tightly wrapped in thread. When wound firmly enough, they did apparently bounce a little bit. Over time, though, the wrapping became more and more decorative and also the primary point of the exercise. 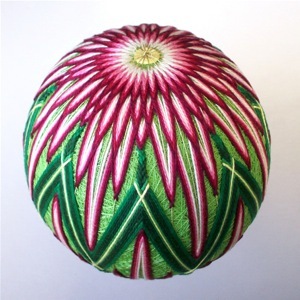 Most are done in geometrical forms, though, as shown above with this gorgeous chrysanthemum . 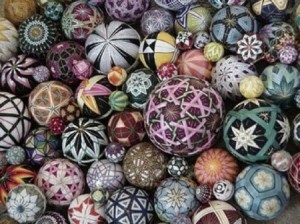 If you want to learn more about how to make temari balls, check out this instructional page at Temarikai.com. You’ll find everything you need to get started. Oh, and I told you I thought they’d look good on a Christmas tree!